The Spectre 9028 fits some Chrysler 300, Chrysler 300C, Dodge Challenger, and Dodge Charger models. See vehicle applications for details. Spectre air intake systems are designed to get more horsepower and torque from your vehicle while working to protect your engine from harmful debris. 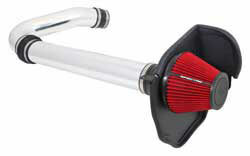 This air intake system comes with a red washable, reusable Spectre low restriction Spectre air filter, polished aluminum intake tubing and a black powder coated heat shield to help prevent heated engine air from entering the intake inlet. 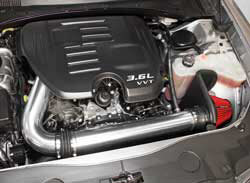 This air intake system places the air filter on the driver side of the engine compartment. Spectre air intakes come with the necessary rubber boots, velocity stack, stainless steel clamps and all necessary hardware for an OE fit and finish.